The weather was perfect for a summer's race of exotic, and expertly prepared sports cars at Mosport International Raceway just outside Toronto. Joining the GT Class (but running as Unclassified) for the first time in 2011, Team Panoz returned with the radical Panoz Abruzzi ‘Spirit of Le Mans’ with drivers Ian James and Edward Sandström. The Panoz, however, was not a factor in the race and it's outing showed that getting to learn a new car is never easy. In the morning warm-up before the race, the #50 UNC Panoz Abruzzi driven by Edward Sandstrom stopped at turn 2 with damage to the left front of the car after hitting the tire walls. On a positive note, the Unclassified run of the Panoz had it come in at P9 (if judged as GT) ahead of such notable entrants as the #01 Extreme Speed Motorsports Ferrari 458 Italia driven by Scott Sharp/Johans van Overbeek, the #98 RSR Jaguar XKR driven by P.J. Jones and Rocky Moran Jr., and the #45 Flying Lizard Porsche 911 RSR driven Joerg Bergmeister and Patrick Long. 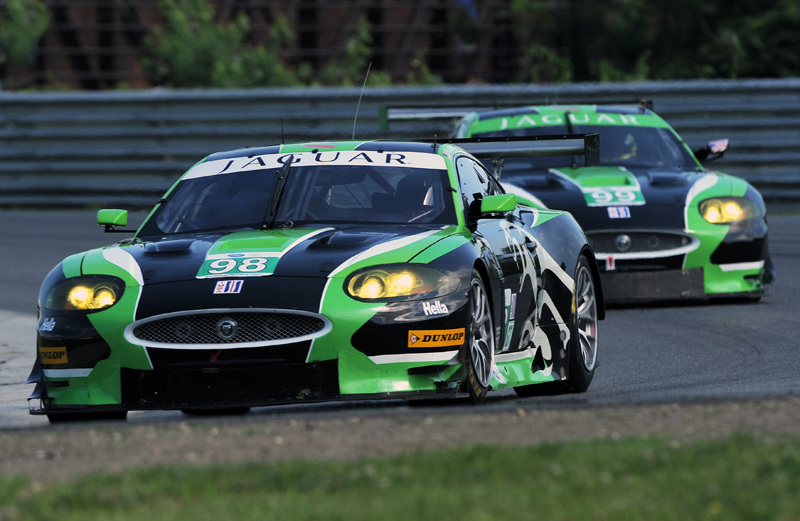 The last notable mentioned is where the hopes for a repeat in the GT Class dimmed. The Flying Lizard Porsche of Bergmeister and Long showed great promise at climbing back into the championship points frey after qualifying well in P3 just behind the two Team RLL BMWs and just .231 seconds behind the season points leading team of the #56 of Joey Hand and Dirk Mueller in P1. The Green Flag drops At 3:03 pm and race was beginning to come the Flying Lizards way when they were able to run at P2 just behind the #56 BMW. The GT madness began after nearly an hour of tight racing when Joey Hand made contact in his #56 BMW M3 GT with Risi Competizione`s #62 Ferrari F458 Italia of Toni Vilander. A penalty for Hand promoted Jeorg Bergmeister and the #45 Flying Lizard Porsche 911 GT3 RSR into the lead. Things were looking great until Bergmeister got his Porsche sideways in Turn 10, handing the lead to Bill Auberlen in the #55 BMW Team RLL entry. Normally, a racer can recover from a spin but the Porsche was not behaving well. At 4:25 pm (1h 22m running), Joerg Bergmeister (#45-GT Porsche 911 GT3 RSR) has radioed that he has lost power steering and will pit for the crew to evaluate. At 4:26 pm (1h 23m running), Joerg Bergmeister (#45-GT Porsche 911 GT3 RSR) into the pits. 4 tires, fuel, driver change: Patrick Long . working on the power steering. At 4:36 pm (1h 33m running), Patrick Long (#45-GT Porsche 911 GT3 RSR) into the pits. No fuel, no driver change. Finished repairs on pit lane. Rejoining the race. This eleven minute repair delay placed the team well down in the field finishing the race at Mosport P12 in GT Class. The #45 Flying Lizard effort entered the race at a real chance of climbing back into the season points race from P3 but leaves dropping to P6. GT championship leader BMW Team RLL`s three-race win streak came to a close at Mosport as a combo of contact, mechanical woes and penalties jumbled the order throughout the two-hour, 45 minute race. After the final round of pit stops and with Dirk Werner in the driver`s seat, it appeared BMW`s biggest concern would be holding off Magnussen`s #4 Corvette Racing Chevrolet Corvette C6.R. But with less than 20 minutes remaining, another penalty cost BMW the lead once again. Officials ruled Werner's contact with GTC leader Pumpelly at Turn 10 as avoidable and called the #55 BMW into the penalty box. It promoted Magnussen and his Corvette to the GT lead. 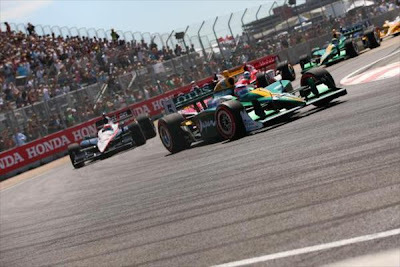 The Honda Edmonton Indy, the 11th race in a 18 race season of the 2011 IndyCar Series Championship, with its new track layout, proved to be a little less of a bump and run affair than predicted but was not without its contentions. In the end, at 55 points down to series points leader and last year's Championship winner, Dario Franchitti, Will Power came away from Edmonton with a commanding performance for the win. Great hope bubbled over and finally fizzed out for two of the three team-mates of KV Racing Technology-Lotus. Takuma Sato qualified in the Peak Pole position and E.J. Viso in position 5 on the grid and as predicted, turns #1, #5, and #13 were pivotal to the fortunes (or lack thereof) of these KVRT-Lotus drivers. At the drop of the checkered flag, Takuma Sato led the field in strong fashion until he locked-up his brakes before turn #13 on Lap 19 which allowed eventual winner Will Power to steal the lead. After the first pit stop, the Japanese driver had fallen back to P5 but surged to the front again following a spectacular re-start through turns #1, #2, and #3. He sliced back into second behind Power under braking for the Turn #5 hairpin, while just behind in P4, his team-mate Viso slid into Scott Dixon, spun and stalled. E.J. Viso said: "I started up at the front and on one of the restarts I made contact with Dixon, which I feel bad about as he finished the race some laps behind. It was a pretty messy corner and I got too close and braked on the inside and we hit. I then lost a lap waiting to be restarted and from then on there was not much else we could do. We had a pretty fast car during the race. I think I got the second fastest time and we showed we were strong as a team all weekend. I want to thank everyone who is part of KVRT–Lotus who has helped make us stronger and also my sponsors PDVSA. I really feel bad. I thought we had a chance for a podium." E.J. finished the race in P20. As for Sato, he was able to soldier on until he had a problem with another driver, Ryan Hunter-Reay with Andretti Autosports, battling for space in turn #13. Takuma Sato said: "It is disappointing finishing in the back like this. The start was very exciting. I had a good feeling leading the race. Then I had a little problem with the balance and lost some positions. After that there was a caution and we changed tires. On the restart I regained most of the positions and was running in second. Everything was looking good and I was comfortable with the pace, but unfortunately Hunter–Reay hit me and damaged my car and put me a lap down. It was a long race after that and very difficult to stay motivated. I feel very bad for all the crew. They worked so hard all weekend. It was a positive weekend for us until the middle of the race. I am just so disappointed." Takuma Sato finished the race just behind Viso in P21. On the brighter side, KV Racing Technology-Lotus driver Tony Kanaan finished fourth on the re-configured airport tarmac asphalt in Edmonton on Sunday. 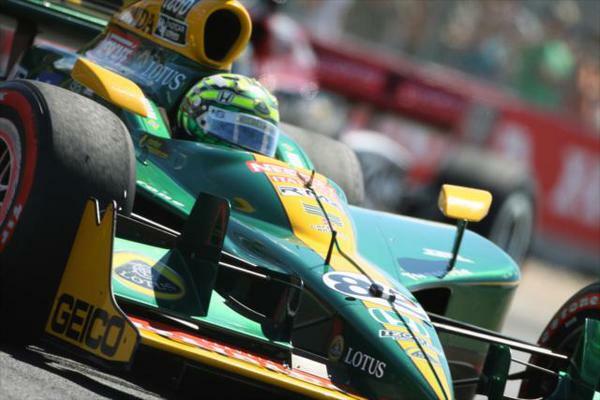 "It was a good result, it was a good race and it's great for the Geico – KV Racing - Lotus crew," Kanaan said. "If felt good being out there with those guys, you know, all guys that know what they are doing like Justin, Ryan and Dario. We had some great battles and finishing fourth after starting eleventh, and on top of that having a bad pit stop, is pretty rewarding, especially considering that I got back to fourth in the championship. I feel bad for my teammates because I know that all the three KV cars were supposed to be in the top-five." As for Will Power, last years points leader at this stage of the season and eventual runner-up to Dario Franchitti was able to claw his way back into the championship fight. Starting the day 55 points down, Will was able to pass and hold off the challenges of Takuma Sato, team-mate Helio Castroneves and Dario Franchitti to gain 17 points (15 points for position and 2 points for most laps led) in the season points championship. Will Power will enter the next race at another road course only 38 points down, at a race track where he has had some success at but has never won. Last year, for example, he qualified for the pole, but the driver who qualified in P2 ended up winning while Power finished in P2. 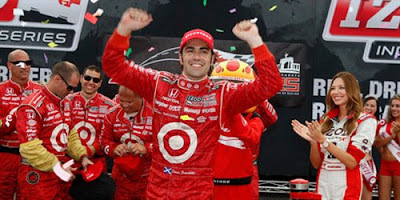 Yes, that driver was the Target Chip Ganassi Racing #10 Dallara, Dario Franchitti. FYI - It took only 78.9590 seconds for Dale Coyne Racing's Sebastien Bourdais to record the fastest lap of the race on Lap 80 of the 80-lap event. "SeaBass" ... the former annual ChampCar World Series champion (he won four consecutive driver championships with Newman/Haas Racing) finished in P6 over the two Canadian events (Toronto and Edmonton) which represent the season's best finishes for him and Dale Coyne Racing. 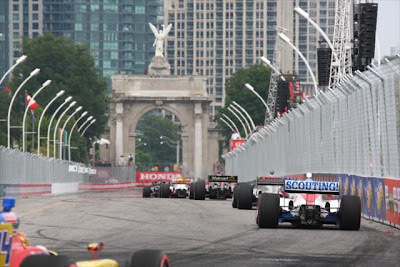 The attrition in a race that was expected to be high, due to tempers that may have flared at the end of the full course Yellow Flag plagued Honda Indy Toronto and the track re-configuration with the tight turns of #1, #5, and #13 at the end of long straightaways, was very low. Eighteen (18) cars finished on the lead lap -- the highest total of the season. 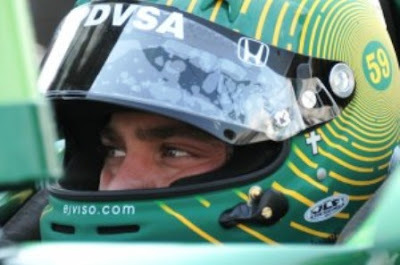 Ernesto José Viso Lossada (born March 19, 1985) is a Venezuelan race car driver. 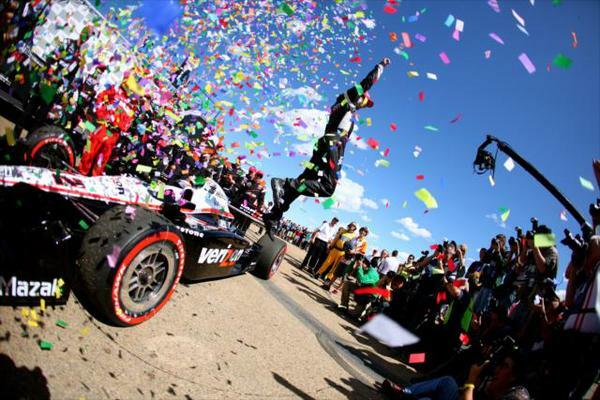 He is commonly referred to as Ernesto Viso or, since his move to American racing, E.J. Viso. Viso was born in Caracas, Venezuela. He has raced in the 2005 and 2006 GP2 Series seasons, and has also driven the third car for Spyker MF1 Racing. In 2007 he competed in the GP2 Series for Racing Engineering. Starting in 2008, he raced in the United States for HVM Racing which had just merged into the IndyCar Series (ICS) from the ChampCar World Series (CCWS). He raced through the next year until joining another CCWS merged team of KV Racing Technology-Lotus in 2010. We catch up with E.J. before the second race of a 2 race swing through Canada, the 11th race in a 18 race season at Edmonton, Alberta Canada. You are now in your second season with KVRT-Lotus, do you have opportunities to learn by sharing information, technical feedback or experiences with teammates and their engineers? Yes, it’s always good being part of a team. A lot of what we’re doing now is a continuation of work we started last year with Takuma and the guys, and Tony brings new information. We really don’t change very much, its more like evolving the program and it just keeps growing. You had some tough luck in Toronto [Race 10 of 18 in 2011] but still finished pretty well. Is that kind of representative of your year so far? Well, I did have some bad luck with punctures in Toronto. I think really every race this year except maybe Iowa, where we had a major problem with the car, we’ve always been very competitive, running a lot in 5th or 6th, but unfortunately we haven’t finished as many races as we’d like. Sometimes my fault, sometimes the team’s and sometimes other circumstances, but we know we’re good, we know we have the speed , we’re getting better all the time and just need to stay strong and do it. 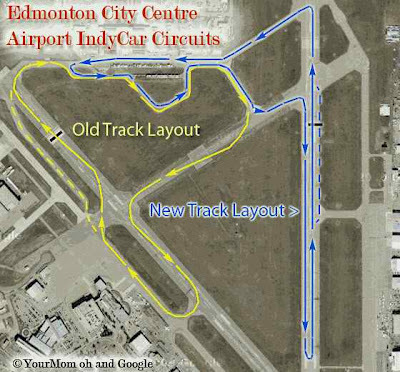 Nobody is familiar with this new Edmonton track, but with the long straightaways and hairpins many drivers say there are passing opportunities but it could be a demolition derby. What are your thoughts? That’s probably true. The first corner is way slower than it looks and is very tight in the exit. It’s almost like a dragster, you’ve got to stop and go, so car setup is very important and you need good braking and good traction. I’m sure a lot of people are going to be driving very soft cars to try to accommodate the needs of the track. With 3 very slow corners you’ll need to get power early. This race, I think, is going to be similar to Toronto. It’s funny, because my mentality there was only to finish. I never, ever, took any kind of risk during the race and kind of let the race come to me and that’s the same mentality to bring to this place. It will be a very physically demanding race here, it’s easy to make mistakes and there are going to be some accidents. Just by keeping calm, having good pit stops and trying to save a little fuel so the last stop is as fast as possible is important. On the business side of things how has the relationship with a name like Lotus affected your ability to expand your personal brand or create marketing opportunities? The program we put together, that is, Lotus and KV, is very important. At the end of the day KV is a team, but Lotus is a car company, is bigger and very appealing to sponsors and the media. It’s positive for me, the team, for everybody and I hope it’s the first of many years. FOOTNOTE: E.J. 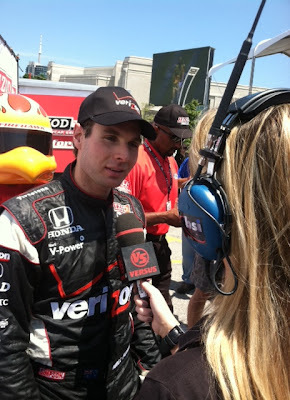 Viso, in "Knockout" qualifying made it into the "Firestone Fast Six" and registered a P5. KV Racing Technology-Lotus teammate, Takuma Sato took his second pole position of the season, and his first road course pole position in the IndyCar Series. Here we are at a point with only six races left to make a sizable impact in a trend of lopsided wins in the GT Class. One may really like the fact that the American Le Mans Series style of closed body, street/road track, timed distance format (sometimes straddling day-part), and multiple performance/body style classes running at different speeds, makes for interesting viewing and tracking, but let's be honest ... the only real competition on the track that exists for the duration of most any season, and certainly this one in 2011, is the class of the Classes, the GT Class. The exotics in the LMP1, LMP2 (not at Lime Rock) and LMPC Classes are very interesting but there are not enough players to make this portion of what is going on down on the track, except for style and speed, interesting. The GTC Class has multiple entrants, but do not have the wide representation of manufacturers that the GT ClaSS puts up. So we choose to follow, with interest and some intensity, the GT Class in this round #4, American Le Mans Series presented by Tequila Patrón - Mosport International Raceway / Bowmanville, Ontario, Canada - July 22 – 24, 2011, contest. The set up at Mosport is simple, BMW Team Rahal Letterman Lanigan (RLL) has been running a hot Hand (driver Joey Hand, that is) and former Ferrari stand out, Dirk Muller (Mosport fastest lap holder at 1:18.012 - 113.475 mph, August 2008 - Ferrari F430 GT), with three wins in three races. All other teams need to beat the #56 BMW in order to eat into a possible walk into the championship by season's end by both Hand and Muller. 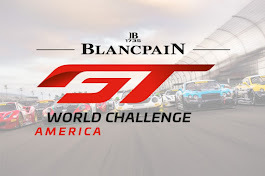 Those who hold the remote possibility of a chance to even think of a championship is held by the two classic annual rivals, last year's champions, Joerg Bergmeister / Patrick Long of the factory Porsche Flying Lizard team and Oliver Gavin / Jan Magnussen of Corvette Racing. The driver pairings and teams are almost tied at 37 points for Corvette, 34 points for Porsche, against the 70 points held by the #56 of Hand and Muller. The biggest and most glaring difference between these two challenging teams is that the 34 points held by Flying Lizard Porsche team was achieved in only two races with one DNF whereas the Corvette Racing challenge of 37 points was achieved in all three races. Hartmut Kristen, Porsche Head of motorsport: "Mosport is a track where engine performance is more important than on any other circuit. For this reason we were thrilled to hear that the rule-makers in the USA want to revise the imbalance that disadvantaged our cars. 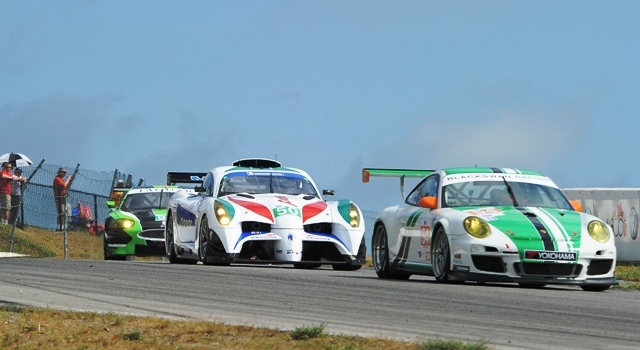 I hope that Flying Lizard and the Falken and Miller teams can continue their upward trend that they showed in Lime Rock." Joerg Bergmeister, #45 co-driver: "Last year we travelled to Mosport without high expectations and we won. It’s not normally a circuit that particularly suits us and it features too many straights. But if we can manage to make everything come together like in Lime Rock recently then we might bring home a podium result. I’d be very happy with this." Patrick Long, #45 co-driver: "It’s not easy making a reliable prediction for Mosport. The track is very fast, and very demanding for the driver. It’s unforgiving with mistakes. That should work in our favour. I hope we can use this to our advantage." Mosport has been the stage for many of Corvette Racing's winning performances. The team has tallied eight victories there, including its first win in the GT2 category (since renamed GT) in 2009. That race featured a spectacular wheel-to-wheel duel between Jan Magnussen and Ferrari rival Pierre Kaffer in the final 30 minutes. Magnussen prevailed by .331 seconds at the finish. "The whole circuit is a huge challenge, one that I relish," said Magnussen's teammate, Oliver Gavin. "We always go into that race with a strong car and the track seems to suit the Corvette's strengths. "Our car's balance and braking is very good, and we seem to be quick in the tight Turn 5 area and coming into Turn 8 at the end of the back straight," Gavin explained. "One of the most daunting parts is Turn 2, and it's also the most fun when you get it right. The corner entry is blind, you turn in and the track starts to fall away almost immediately. You need absolute trust in the marshals to tell you if there's a problem ahead." 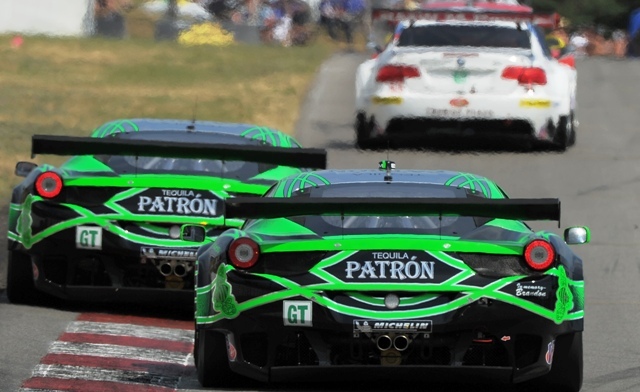 Corvette Racing has unfinished business at Mosport. Last year's event was red-flagged with 30 minutes remaining when the guardrail lining the high-speed Andretti Straightaway was severely damaged in an accident. The twin Corvettes had completed their final pit stops and were in position to race for the win when officials cancelled the remainder of the race. "If the race had restarted we would have been in a good position," said Magnussen. "We had a strong car, things were shaping up, and we would have had a shot at it. I'm looking forward to going back there and setting the record straight." There are many more cars on the track, starting with one more BMW (#55 driven by Bill Auberlen / Dirk Werner) from the Team RLL stable which sits fourth in the points overall tied with one more Corvette (#3 driven by Olivier Beretta / Tommy Milner) at 33 points in GT Class, but none have more at stake against another winning performance from the #56 BMW of Hand and Muller than the #45 Porsche and the #4 Corvette. From the frying pan and into the fire. After the exciting, yet full course caution plagued Honda Indy Toronto, the IndyCar Series (ICS) heads on over to the Canadian province of Alberta, and the 2.25 mile temporary road course set up on an airport runway/tarmac in Edmonton. This year, the course layout changes from a course that tracks around clockwise with long, high speed turns and few real straightaways, to a course that tracks counter-clockwise and features 13 turns, a nasty hairpin turn that separates two long straights made from a landing/takeoff runway, and another slightly curved straight that dives into another situation similar to " Turn 3" at the end of the only high speed straight in Toronto. If NASCAR tactics of tap, spin, and run worked for Dario Franchitti to increase his points lead over Will Power, look for at least three areas in Edmonton to promote the same type of carbon-fiber, wheel bumping close competition in order to gain advantage. Turn 1 out of the pits and at the end of the long straight past the Start/Finish line (the longest of the new layout). The corner is an unusual left hand power turn (120%) that leads to a speed section with a slight right-hand kink at Turn 2 and a high-speed left/right jig at turns 3 & 4. The second kinked straight ends at Turn 5 in another hard left-hand turn (curved 180%) that tracks through a curvy section that was used in the previous layout. Lastly, starting at turns 10 & 11, a long 150 mph straight made from a landing/takeoff runway that ends in a nasty hairpin at turn 13 that starts the process over again with the longest straight (3/4th of a mile - nearly 200 mph) in the new course. Will Power fans would love to see Dario spun around as he had spun Power in Toronto on Turn 3 ... but through a conspiracy of team work/orders. The way nose wings can be popped off and on (as Penske's Will Power - photo above, Andretti Autosport's Ryan Hunter-Reay and Danica Patrick experienced in Toronto), and the additional strength designed into the Dallara suspension parts for side (non-torque) impact, it is not inconceivable something like this could be orchestrated. Penske isn't the only multiple car team that may want to get in the middle of this concept. If Target Chip Ganassi Racing is allowed to get away with the type of "advantage" driving Dario was able to pull off, then let the flood gates open. From the frying pan and into the fire? 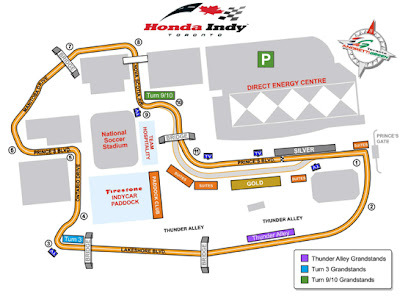 ... with the redesign of the layout of the Edmonton City Centre Airport IndyCar race track, let's just call this part of the schedule (Race 10 Toronto/Race 11 Edmonton) Canadian Bacon - tempers will fry! 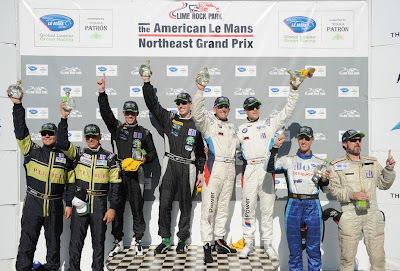 Chris Dyson and Guy Smith drove their Dyson Racing Lola-Mazda MZR-R to their first win of the 2011 season. The hunt for the LMP1 championship in the American Le Mans Series presented by Tequila Patrón lost none of its intensity over the Series` two-month break. 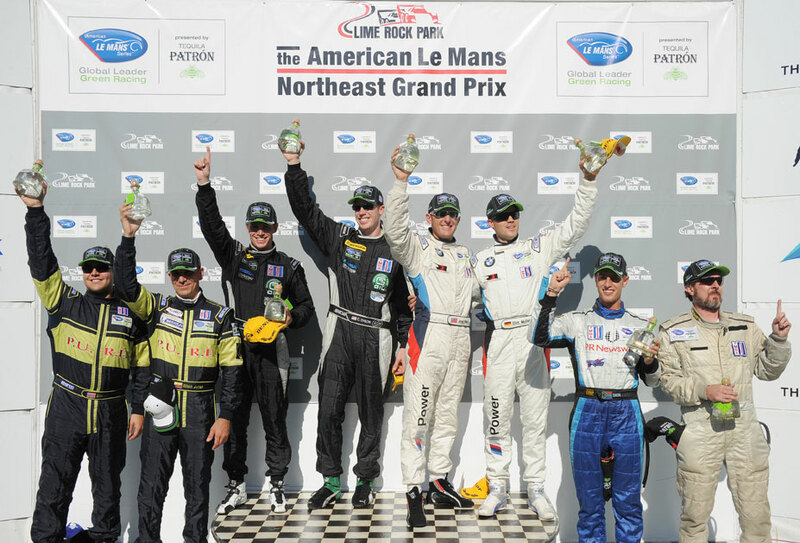 Dyson Racing maintained its title lead with a victory in the American Le Mans Northeast Grand Prix. The duo of Chris Dyson and Guy Smith exchanged the lead six times with Muscle Milk Aston Martin Racing on Saturday and took the overall victory. BMW Team RLL also picked up where it left off, scoring its third consecutive GT victory. Dyson Racing won by 19.969 seconds over the Muscle Milk Aston Martin squad. It was the first ALMS win for Chris Dyson at his home track. Dyson`s second Lola-Mazda, driven by Humaid Al Masaood and Steven Kane, finished third. Starting from the pole, Dyson Racing`s Chris Dyson had his work cut out for him in the No. 16 Lola-Mazda, holding off Lucas Luhr`s No. 6 Aston Martin-powered Lola in the opening laps through a swarm of traffic on the 1.474-mile road course. Luhr dispatched Dyson on lap 16, but was then forced to pit early to replace a flat tire. "It was great fun," Dyson said. "Lucas and I were going back and forth from the get-go. It was all about where you positioned yourself. It felt a bit like a video game. Our Mazda was fantastic from the start. I think the car really came into its own at the end of the race. We were lucky to catch the yellow when we did. They fought us hard all the way like they always do." After three races of the nine-round ALMS season, Dyson and Smith lead the drivers’ championship, Dyson leads the team, and Mazda leads the manufacturers’ championships. The driver points lay out as follows - #1) Dyson Racing Mazda's Chris Dyson and Guy Smith - 66 points each, #2) Muscle Milk Aston Martin Racing's Klaus Graf and - Lucas Luhr - 36 points each, #3) Dyson Racing Mazda's Jay Cochran - 30 points. 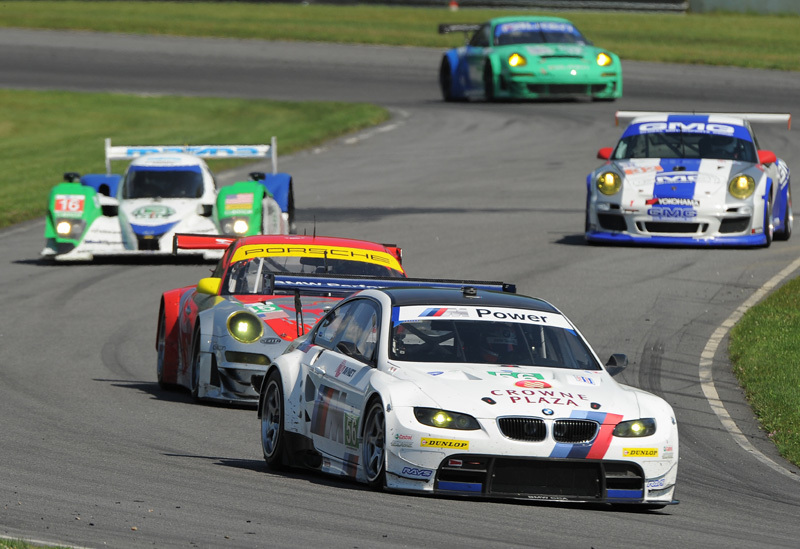 BMW Team RLL extended its GT Class winning streak to three as the No. 56 BMW M3 GT of Joey Hand and Dirk Mueller topped Flying Lizard Motorsports` Patrick Long and Joerg Bergmeister in the No. 45 Porsche 911 GT3 RSR. "Team RLL, BMW, Dunlop, have done a very nice job," Hand said. "The things we have now have made the car more comfortable and more in the zone. That`s how you win races. That`s a real key and real testament to BMW Team RLL and BMW Motorsport. Dunlop is really stepping up. They have a very consistent tire now." "Winning is always very sweet and very important and it`s good to collect the points," Mueller, Hand's teammate said. "Like Joey said, we`re in year three. Everything is now coming together like it is supposed to. I think we turned three screws on the car before we started the race. The break [between Long Beach and Lime Rock] was massive but we tested in between. At the level we are racing, it has changed so dramatically. Now we have a car that you need to push from the first second. Winning three times in a row looks so easy now." A smart opening-lap pass by Long on the No. 55 BMW M3 driven by Dirk Werner enabled the Porsche driver to move into second and chase after Hand. Behind them, havoc in West Bend damaged both of the Corvettes, Werner`s BMW and the No. 02 Extreme Speed Motorsports Ferrari F458 Italia. Long and Bergmeister kept their Porsche within striking distance of the leading BMW throughout the race. Though constant traffic provided some hair-raising moments, a true opportunity for a lead change never materialized. Fresh from a podium finish at the 24 Hours of Le Mans, Robertson Racing scored its first ALMS podium with a third-place finish Saturday for David Murry and Anthony Lazzaro. Starting seventh in class, the No. 04 Doran Ford GT first appeared in the top three following the chaos in West Bend. The Ford was eventually caught by Team Falken Tire`s No. 17 Porsche 911 GT3 RSR. Lazzaro was shown in fourth at the line, but a 90-second avoidable contact penalty on Team Falken Tire elevated Murry and Lazzaro to the final podium position in GT. At the end of race interview, Patrick Long felt better about their Flying Lizard effort here in Lime Rock with a complete race under his and Joerg's belt. It helped to put behind his (Long's) troubles at Long Beach where he had a DNF after showing promise early just to crash out. The biggest disappointment suffered in the GT Class had to be felt in the Corvette camp with Oliver Gavin and Jan Magnussen only able to post one point in the overall driver's championship and teammates Olivier Beretta and Tommy Milner post only two points. With one third of the season having been played out, #1) BMW Team RLL drivers Joey Hand and Dirk Mueller with three successive wins have 70 points each, #2) Corvette Racing's Oliver Gavin and Jan Magnussen - 37 points each, #3) Flying Lizard Motorsports Factory Porsche Team's Joerg Bergmeister and Patrick Long - 34 points each. 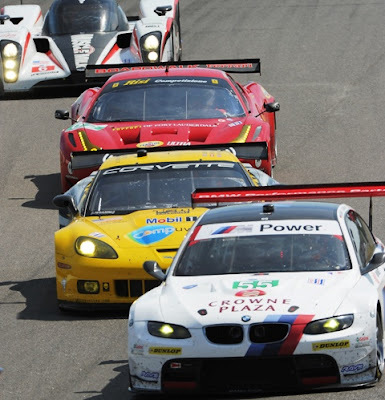 The other two classes, LMPC and GTC, also have great competition but for the purposes of this inaugural post, we will focus on the overall leader competition and the class that gets the most attention because of the strong factory interest and participation between BMW, Porsche, and Corvette ... it doesn't get any better when racing full-bodied, beefed up sports cars. 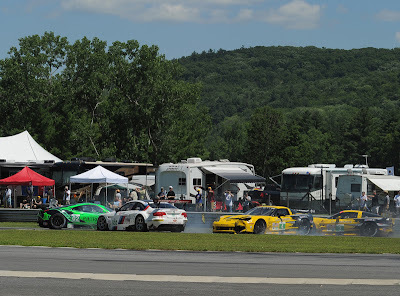 Lime Rock Park, Lakeville, Conn.
1. (1) Chris Dyson, Pleasant Valley, NY; Guy Smith, Bracken, Yorkshire; Lola B09 86/Mazda (1, LMP1), 187. 2. (3) Lucas Luhr, Monte Carlo; Klaus Graf, Dornham; AMR/ Lola Coupe B08 62 (2, LMP1), 187. 3. (2) Humaid Al Masaood, Abu Dhabi; Steven Kane, Newtownards; Lola B09/86 Mazda (3, LMP1), 182. 4. (4) Eric Lux, Jacksonville, FL; Elton Julian, Santa Monica, CA; Oreca FLM09 (1, LMPC), 181. 5. (5) Ricardo Gonzalez, Monterrey; Gunnar Jeannette, Salt Lake City, UT; Oreca FLM09 (2, LMPC), 181. 6. (6) Tomy Drissi, Los Angeles, CA; Kyle Marcelli, Barrie, ON; Oreca FLM09 (3, LMPC), 180. 7. (10) Joey Hand, Sacramento, CA; Dirk Mueller, Monte Carlo; BMW M3 GT (1, GT), 176. 8. (12) Patrick Long, Bellaire, FL; Joerg Bergmeister, Langenfield; Porsche 911 GT3 RSR (2, GT), 176. 9. (9) Jarrett Boon, Phoenix, AZ; Anthony Nicolosi, Palm Beach, FL; Oreca FLM09 (4, LMPC), 175. 10. (7) Frankie Montecalvo, Highlands, NJ; Jon Bennett, Fort Mill, SC; Oreca FLM09 (5, LMPC), 175. 11. (18) Bryan Sellers, Braselton, GA; Wolf Henzler, Nuertingen; Porsche 911 GT3 RSR (3, GT), 174. 12. (16) David Murry, Atlanta, GA; Anthony Lazzaro, Atlanta, GA; Doran Ford GT (4, GT), 174. 13. (19) Scott Sharp, Jupiter, FL; Johannes van Overbeek, San Francisco, CA; Ferrari F458 Italia (5, GT), 174. 14. (21) Bryce Miller, Summit, NJ; Sascha Maassen, Lontzen; Porsche 911 GT3 RSR (6, GT), 172. 15. (15) Seth Neiman, San Francisco, CA; Marco Holzer; Porsche 911 GT3 RSR (7, GT), 165. 16. (25) Mike Piera, Newtown, Conn.; Dion von Moltke, Coral Gables, FL; Porsche 911 GT3 Cup (1, GTC), 164. 17. 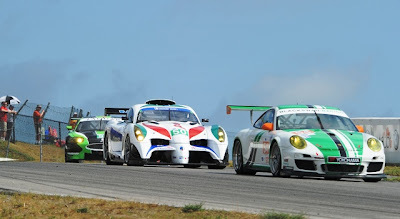 (26) Duncan Ende, Los Angeles, CA; Spencer Pumpelly, Mason Neck, VA; Porsche 911 GT3 Cup (2, GTC), 164. 18. (27) Bill Sweedler, Westport, CT; Butch Leitzinger, Rebersburg, PA; Porsche 911 GT3 Cup (3, GTC), 164. 19. (23) Tim Pappas, Boston, MA; Damien Faulkner, County Donegal; Porsche 911 GT3 Cup (4, GTC), 164. 20. (11) Dirk Werner, Kissenbrück; Bill Auberlen, Redondo Beach, CA; BMW M3 GT (8, GT), 163. 21. (14) Olivier Beretta, Monte Carlo; Tommy Milner, Leesburg, VA; Chevrolet Corvette C6 ZR1 (9, GT), 161. 22. (29) James Sofronas, Newport Beach, CA; Alex Welch, Englewood, Colo.; Porsche 911 GT3 Cup (5, GTC), 160. 23. (13) Jan Magnussen, Roskilde; Oliver Gavin, Yardley Hastings; Chevrolet Corvette C6 ZR1 (10, GT), 156. 24. (17) Ed Brown, Las Vegas, NV; Guy Cosmo, West Palm Beach, FL; Ferrari F458 Italia (11, GT), 153. 25. (24) Chris Thompson, Englewood, Colo.; Nick Ham, Evergreen, CO; Porsche 911 GT3 Cup (6, GTC), 149. 26. 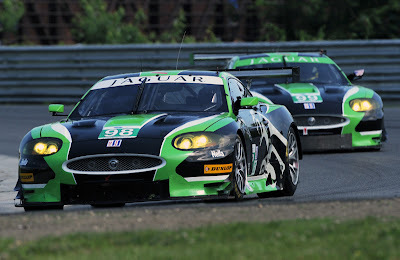 (20) Cristiano da Matta, Belo, Horizonte; Bruno Junqueira, Brazil; Jaguar XKR (12, GT), 149. 27. (8) James Kovacic, Forrester Beach; Jon Field, Dublin, OH; Oreca FLM09 (6, LMPC), 126, Mechanical. 28. (28) Andrea Robertson, Ray, MI; David Robertson, Ray, MI; Doran Ford GT/Elan (13, GT), 116, Mechanical. 29. (31) Toni Vilander, Kankaanpaa; Jaime Melo, Milan; Ferrari F458 Italia (14, GT), 79, Mechanical. 30. (22) Peter Lesaffre, Rye, NH; Jaap van Lagen, Ede; Porsche 911 GT3 Cup (7, GTC), 74. 31. 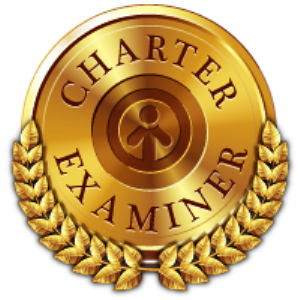 (30) PJ Jones, Torrance, CA; Rocky Moran, Ladera Ranch, CA; Jaguar XKR (15, GT), 49. 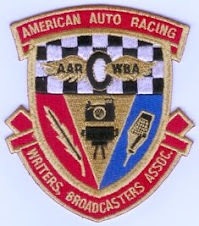 Thanks to the American Le Mans Series for article and resource assistance in the crafting of this posting. Round 10 of 18, the Honda Indy Toronto proved to be one of the toughest tests of man, women, and machine of the season. We are beginning the second half of the season and what was shaping up to be a tightly contested two to four driver series championship points race was undone in part due to timing and, of course, full course yellow flag caution periods. Will Power, entered the race by securing the pole, but still 20 points down to Dario Franchitti, the driver that took the points lead last year in the last race in order to secure his third IndyCar Series Championship. 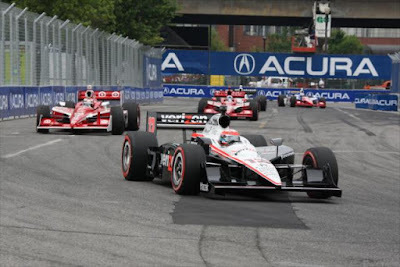 Will Power has done well here in Toronto (reining 2010 race winner) and he was hoping to climb back in the middle of the race for the season points lead on the strength of his Firestone Fast Six Peak Pole Award starting position. The flag drops to start the race and everything looked good at the beginning because Will's car and his driving skill had the best of the two red Target Chip Ganassi racing Dallaras behind him. At about lap 27, Dario Franchitti heads into the pits a little early to shake things up and get on a different pit sequence and this became the first chink in Power's hold on the lead. Three laps later, Power teammate Helio Castroneves spins out Alex Tagliani in turn 3 bringing out the second full course caution out of eight in the race. This, on restart, places Dario Franchitti at the lead of the race and in attitudinal control from this point forward. Double-file restarts become the attention draw they were intended to be, with three-wide contests going into turn one and cleaning themselves up by turn two, only to increase the level of contest going into the end of a high-speed straight at turn three where most of the day's full course cautions were launched. By lap 54, with the help of a slowing Simona de Silvestro, Power was able to gain enough spots to pass by and get ahead of Dario Franchitti where Power felt he could recapture the lead of the race on pit sequence, but Dario had other ideas. When the next time these two drivers came to turn 3, Dario decided to stick his nose in where there wasn't any room and pulled off a NASCAR style punt on Will ... and spun him around. By the time Will Power was able to get turned back around and running, he was back in the fields at P13. The IndyCar Series Championship points gap between Franchitti and Power enlarges to 55 before going on to Round 12 of 18 at Edmonton, July 24th, 2011. Afterward a furious Power said the series officials should have taken action against Franchitti. "It doesn't surprise me that he didn't get a penalty, because he never gets penalized, it's pretty typical," said Power in an interview with Versus. "It was a pretty dirty move. He just turned me around. Does anyone ever penalize this guy? He's as dirty as you like. "I left the inside open on the brakes. I'm really disappointed with Dario. I always race him clean, and he always races me dirty. He did the same at St. Pete, though I didn't say anything, and he did the same today. Disappointed in Dario. The guy who mouths off about everyone and whinges about everyone, and he's the guy who races the most dirty, never gets a penalty from IndyCar. It's just not right." There was a lot more that ended up not being right as there was hot action around turn three, the pits, and the rest of the track for that matter. Danica Patrick, for her part, finished yet another race in rolling condition, extending her IZOD IndyCar Series record to 43, but this was not without incident. She ran well all race after starting P21 of 26 cars, concentrating at going fast and had worked her way up to the top 10 when she entered turn three with the Dale Coyne Racing Dallara of James Jakes turned around in the corner on lap 71. 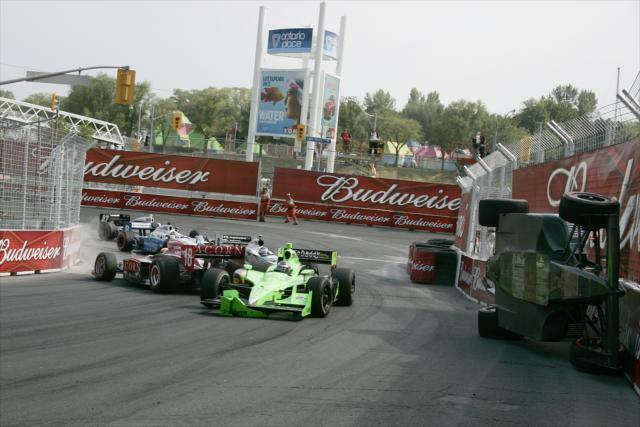 To avoid contact, Danica ended up pushing Alex Tagliani's Sam Schmidt Motorsports Dallara (not his first incident in the race) up on its sidepod along the wall as he, a Canadian crowd favorite, luckily misses injury. This results in damaging Danica's front wing and delivers the eighth and final full course yellow. Confusion ensues for Danica and her team as they do not have a replacement for her damaged front wing. As it turns out, Andretti Autosport gave the wing away to support the effort of teammate Ryan Hunter-Reay on his way to a podium (P3) finish but did not anticipate another incident. As Danica had wait in her pit, Antretti Autosport found a wing in Marco Andretti's pit (Marco finished in P4) and rushed it over to Patrick's pit and it was installed. One can only wonder, if Andretti Autosport were prepared for the Patrick incident (or just any team incident - bad team management process), where would she have ended the race ... probably a lot better than P19 and the next to the last car running on the track ahead of KV Racing Technologies/Lotus team's Takuma Sato, both ending the race six laps down. The crowd was big and full of the excitement generated throughout the race by the close wheel-to-wheel, carbon-fiber action. Can any standard oval race course deliver this kind of intensity and competition throughout a race? Street and road courses look great on TV and the action on small bullring (1 mile or less) courses with close open wheel action has fans on the edge of their seats leaving the regular oval track wanting for something other than "event" trappings to bring people to the track or turning on their TV sets! It is a question fair to ask. 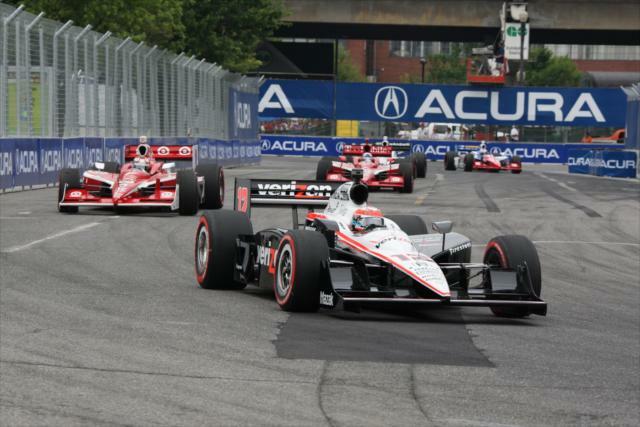 Will Power's love affair with the Toronto street course continued after he snared pole position for Sunday's Honda Indy Toronto. The Australian, who has claimed pole positions in the last eight IndyCar road race events, checked-in with a 59.577-second best lap on the 2.82km Exhibition Place street course for his 21st career pole. But while Power is the defending champion in Toronto, taking top spot on the grid was a new highlight for him. "Man, we really had to work hard for that," Power said after securing the Firestone Fast Six Peak Pole Award. "I've never won a pole here in Toronto and I love this place. When you turn a fast lap here, you're really just exhausted. This is such a physical track. It's a real driver's track with all the different surfaces and all the bumps, you really need to wring its neck out there and that's what I love about it." Power goes into today's race trailing rival and two-time defending series champion Dario Franchitti by 20 points on the 2011 IndyCar Series championship standings. New Zealander, Scott Dixon sits between Power and Franchitti in qualifying and will start alongside the Australian in the front-row while Franchitti starts from P3. "It's great to be on pole here but this is a track where you can really pass a lot of cars and move forward from the back," Power said. Meeshbeer Meeshbeer - Green! Green! Green!! MoreFrontWing More Front Wing - Can't believe lap 1 was clean! Amazing. Talked too soon!!! Briscoe and Kanaan make contact on LAP 3. FollowAndretti Andretti Autosport - Full course caution. Kanaan with a bit of contact. SBPopOffValve PopOffValve.com - I am sure @TonyKanaan is going to unfollow me and never speak to me again after I picked him to win this week. Meeshbeer Meeshbeer – RESTART - Green! Green! Green!! MoreFrontWing More Front Wing - Awesome restart! LAP 27 – Franchitti pits. Fieldof33 Paul Dalbey - Stop me if you've heard this before... Helio takes another driver out of the race and screws over his teammate. SBPopOffValve PopOffValve.com - Helio NERFED Tags. Hmm. Unprecedented HAHAHAHAHAHAHAHAHAHAHAHA. 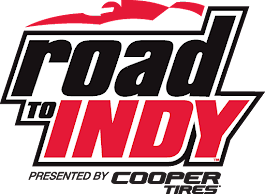 After pitstops – Franchitti, Servia, Wilson, RHR, Hinchtown, Briscoe, Meira, Tracy, Andretti, Hildebrand, Jakes, then Power, Dixon, Conway, and Rahal. GREEN, GREEN, GREEN double file RESTART LAP 36! RESTART LAP 43 - Franchitti, Servia, Wilson, RHR, Briscoe, Dixon, Andretti, Meira Conway, Power, Hildebrand. LAP 44 cars dive into pitlane – Servia has a pick-up problem, gets passed by Wilson and RHR. LAP 48 everyone gets into the pits for tires and fuel … may be the last stop. LAP 49 Graham Rahal leads the field due to an earlier pitstop – then Viso, de Silvestro, RHR, Beatriz, Franchitti, Wilson, Dixon, Power and Andretti round out the top 10. RHR may be in the best position to go to the end without a pitstop for fuel. RESTART LAP 52 side-by-side with lapped Tagliani gives Rahal all he can handle – passes Rahal to get his lap back. Ryan Hunter-Reay gets past de Silvestro LAP 53 and now Power gets past several cars and runs in P6 ahead of Franchitti. LAP 54 Power passes de Silvestro for P5 – Conway heads for the pits with damage. Full Course Yellow – Will Power gets turned around by Dario Franchitti in turn 4 Power stalled. Franchitti now in P5 behind Wilson on LAP 58 during the 5th full course caution. Viso locks up his tires and causes a flat when Wilson tries to pass, Dixon now past Wilson. Graham will need a 44 lap tank full in order to maintain position and win ... or just finish the race. Top 5 are Rahal, Hunter-Reay, Franchitti, Dixon and Wilson. Yellow helps Rahal on his load of fuel with 18 laps to go. LAP 68 Rahal chooses to start from the left on the side-by-side and the restart gets waived off – was this on purpose – for gas? LAP 76 RESTART – Top 5 are Franchitti, Rahal, Dixon, RHR, and Wilson. Three wide into turn 1, Wilson gets turned and collects several cars that include Servia, Hinchcliff and a couple of others. Rahal gets passed by Dixon but it was under Yellow and gets sent back. Andretti causes the chain reaction incident. LAP 80 RESTART – Top 5 are Franchitti, Rahal, Dixon, RHR, and Andretti. Rahal almost passes Franchitti through 1 and 2, gets spun by Dixon and Rahal gets booted back to P13. Dixon charges on to Franchitti and if Dario wins it will be a 55 point lead from 20 before the race over Power going into Edmonton. LAP 83 of 85 laps it Franchitti, Dixon and newlywed Ryan Hunter-Reay in 1-2-3! Five car lengths separate Franchitti and Dixon who is closing. Both are pulling away from Ryan Hunter-Reay. Checkered Flag, Dario Franchitti wins for the fourth time this season and the third time at the Toronto street course venue. 30 career wins gives him 9th all-time and passes Rick Mears who posted 29 wins in his career. 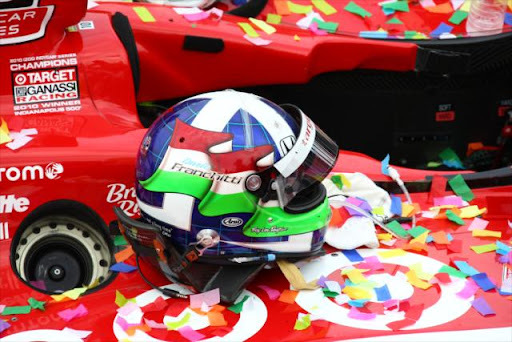 Further, Franchitti is now one win shy of tying Paul Tracy and Sebastien Bourdais for eighth on the all-time wins list with 31. Graham Rahal would have made it on fuel but he believes that if RHR did not hit him, he would have been on the podium. Maybe we should just call this a honeymoon gift. Marco Andretti gained 16 positions in the race and moves up one position in the overall championship. An exciting race to watch and listen to but a horrible race for the ChampCar proud fans of Will Power, Graham Rahal, and Oriol Servia. In the end, Sebastien Bourdais and EJ Viso were the only ChampCar transition drivers to make it into the top ten … and this, technically, is one of their tracks. 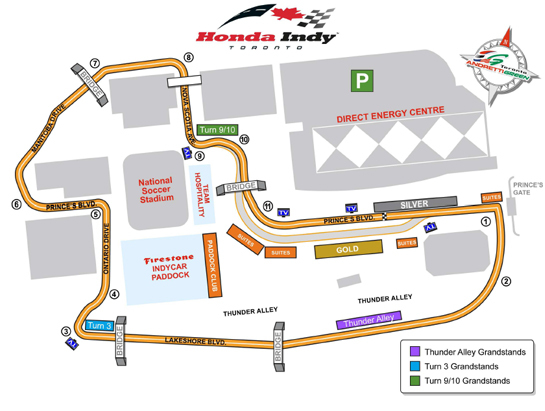 The Edmonton Indy, Round 11 of 18 takes place at Rexall Edmonton Indy Speedway - Edmonton, Alberta, Canada - on Versus at 2:00pm ET, July 24, 2011.